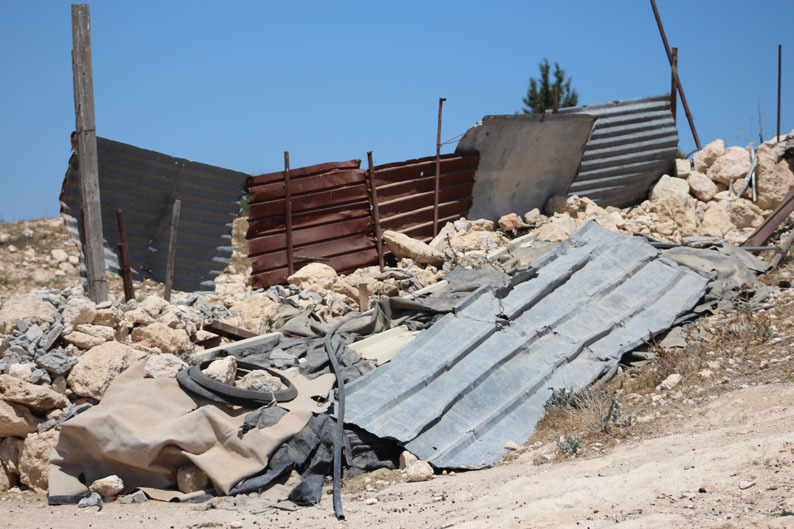 Demolitions have been going on for many years in the occupied territory of Palestine but lately with the Gaza War coming to an end things have escalated through-out the West Bank. Of note the seizure of 400 hectares in the Bethlehem area as a stated act of revenge for the killing of the three Israeli youth earlier this summer. This so called revenge started almost immediately after the kidnapping even though the kidnapping has been widely reported that the Israeli Government knew full well within hours of the kidnapping that two renegades, not associated with Hamas were responsible. With this knowledge the Israeli Government and Army embarked on a wide range campaign of searches, arrests, detentions and harassments including well into Fire Zone 918 in the SHH area. What appears to myself an others to be the case is that for many years now there has been an organized plan to force Palestine farmers and shepherds to move to urban areas like Yatta where of course they will end up living on welfare and losing a way of life that their families has proudly sustained on for generations if not centuries. One purpose could be to clear areas for military exercises. One of the main reasons however more plausible is to provide even more ability for the Israeli Settlements and Outposts to keep expanding. Currently it estimated in excess of 300,000 reside in these settlements and outposts which have been declared totally illegal under International Law. Under Israeli law most Settlements are legal but all Outposts are illegal. 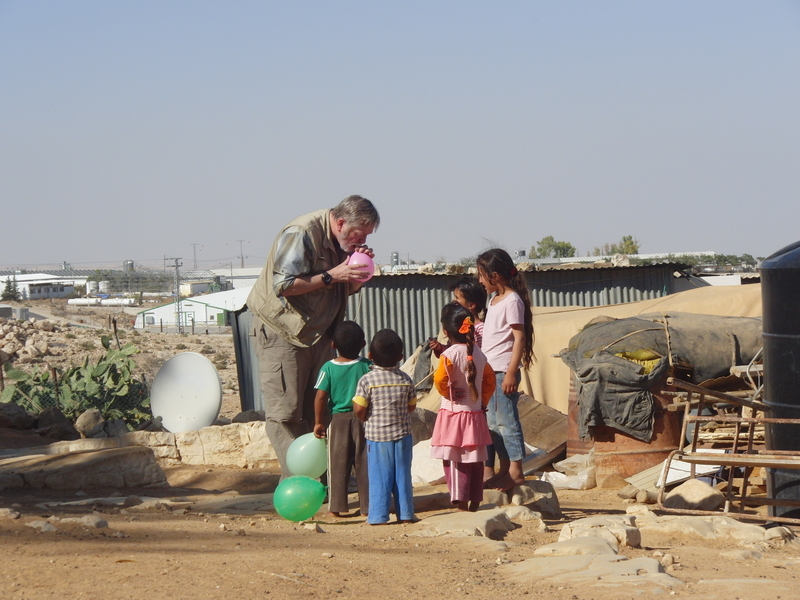 Even with that said the Outposts are all provided the full support of the Israeli Government including supply of electricity, paved roads and ample water to say the least. Normally what happens is that Settlement will be established and soon there after an Outpost will be created on a hill nearby. From there on efforts are continued to link the two and to expand on their territory taking in all of the fertile land and water resources in the area. Needless to say the shepherds and farmers are faced with ever shrinking land to graze their livestock or grow their crops. With even less water resources due to most of the water being diverted to Settlements and Outposts their ability to grow profitable crops and raise livestock is substantially reduced. 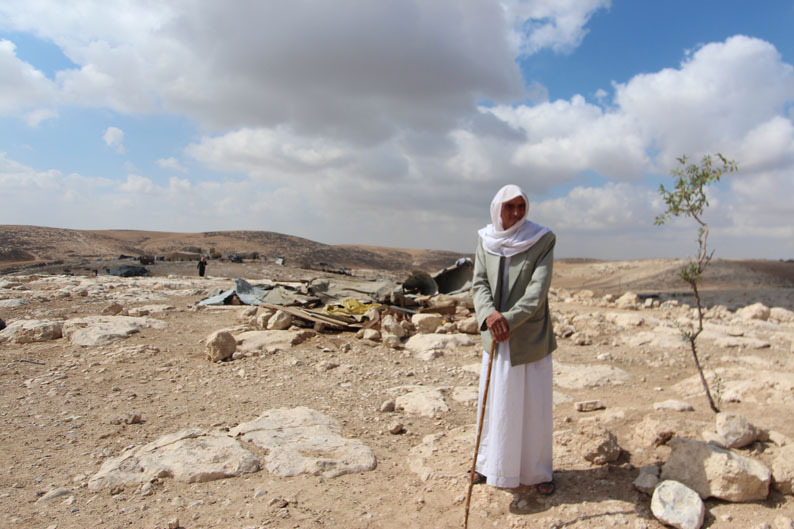 Much of the demolition occurs because the Palestinians have difficulty establishing ownership of the land in Israeli courts. If they do have title it often dates back as far as the Ottoman Empire and the paperwork does not stand up to today’s legal standards. Once property is demolished by the Army if new structures are re-built on the site of the now destroyed structure, the new structure can be destroyed without a new demolition order. 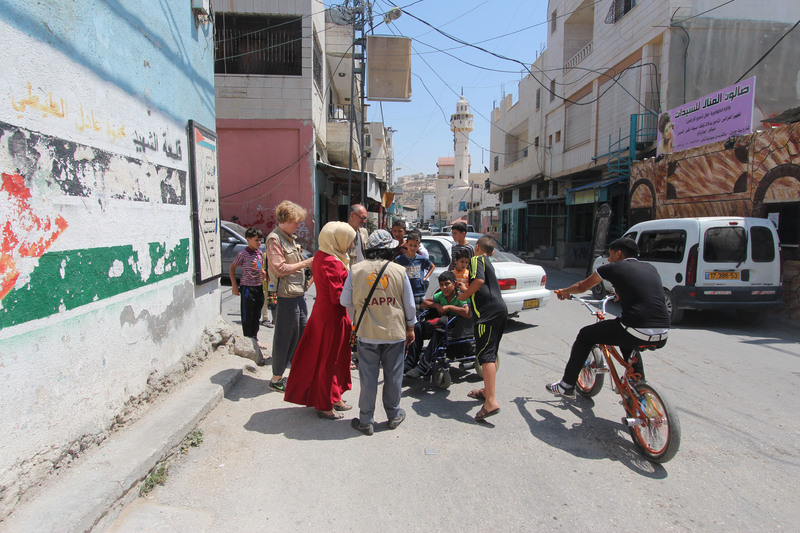 Many Palestinians receive good legal advice through the Norwegian Refugee Council and the United Nations Office for the Coordination of Humanitarian Affairs (Ocha). 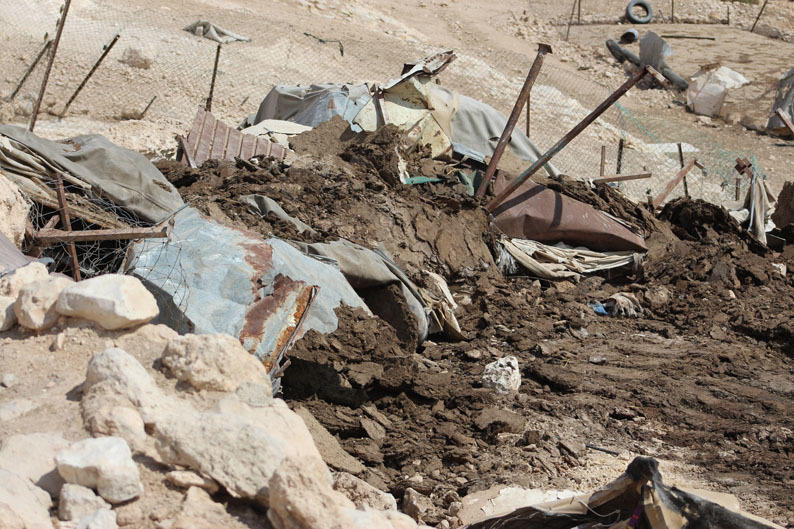 A recent demolition that we attended saw the three residences, two animal shelters and three mobile latrines destroyed by the Army in a matter of minutes. A total of 40 adults and children are now displaced because of this action. 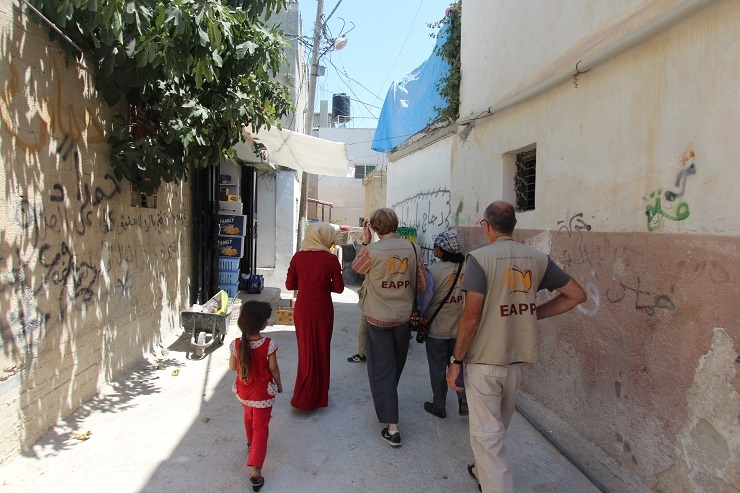 Numerous organizations responded to assist the displaced families including Ocha, The International Committee of the Red Cross (ICRC), B’Tselem, Operation Dove and food agencies. The Palestinians can apply for new building permits but they are very rarely ever granted. The residents of the Settlements and Outposts however continue to expand through every means possible seldom ever being challenged by the authorities. 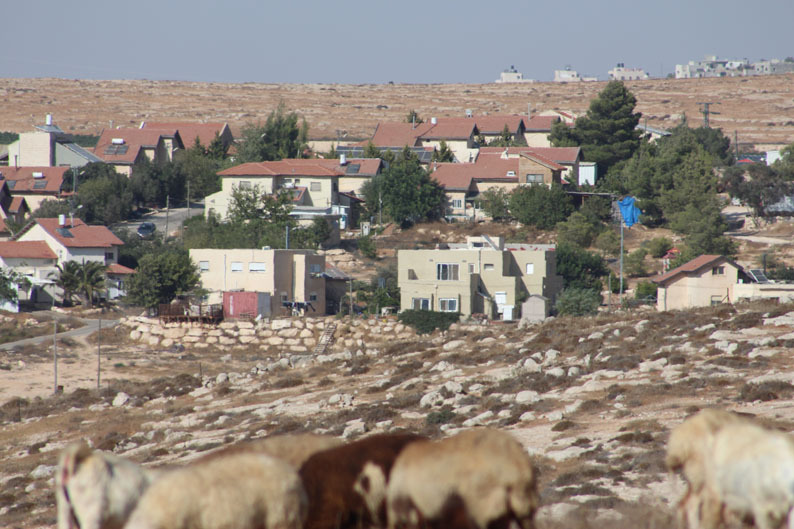 I reported in one of my past blogs on how a Settlement has won the right in Israel courts to expand onto Palestian Land, where I guess one could say that even the original construction of the Settlement was on Palestian land. 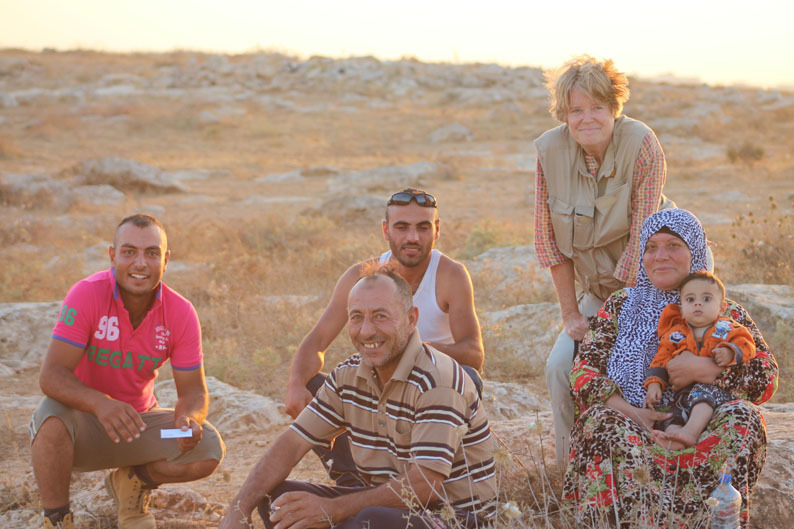 We also documented recently Settlers planting trees on land that is owned by Palestians. The Palestians have no legal authority to destroy these trees on their land, rather have to go through the legal process of trying to have the Courts rule that the trees be destroyed. If they are not successful then over a certain amount of time this Palestian land also reverts to the Settlement based on the record of them growing trees there. 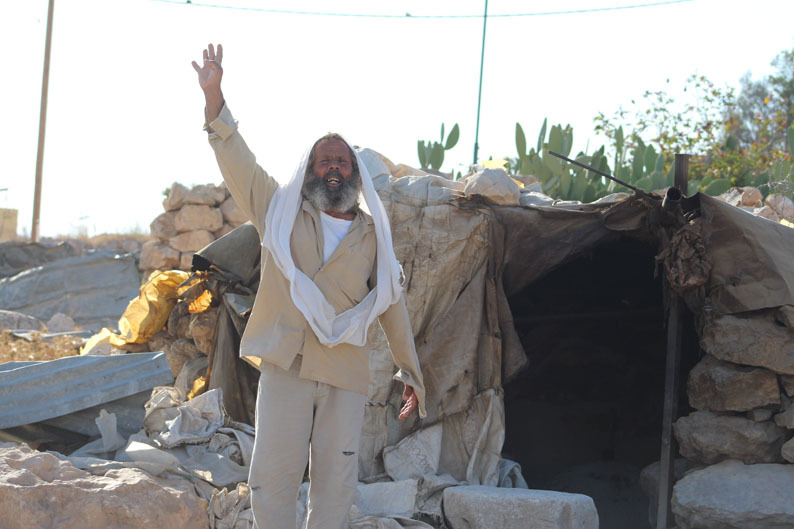 These demolitions by the Army are only part of the story. 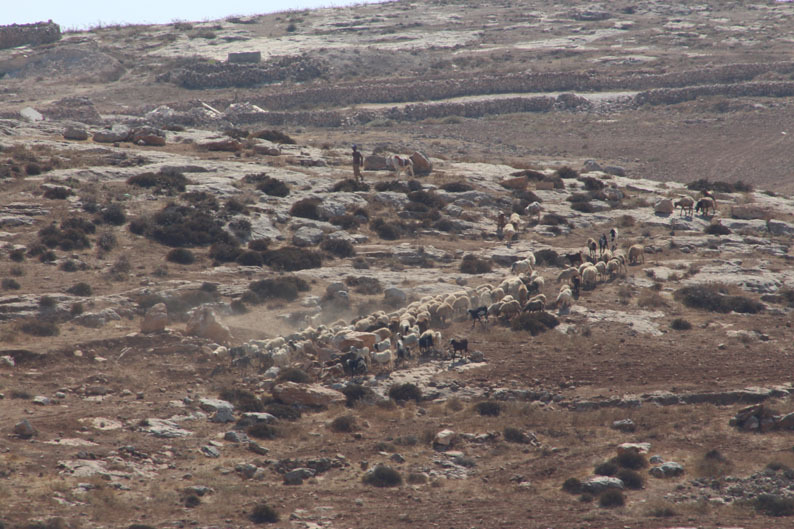 The Palestian shepherds and farmers also have their buildings and crops regularly vandalized or destroyed by the settlers with very little if any action on behalf of the authorities to curtail these actions. 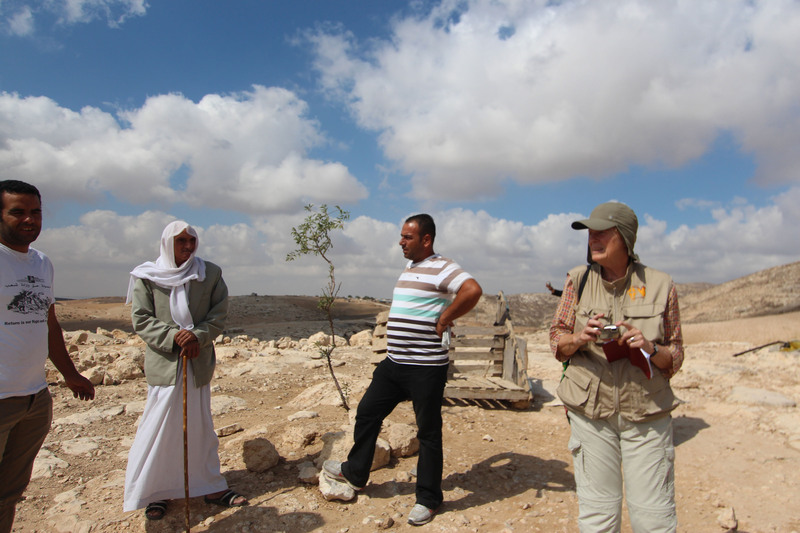 One of the many responsibilities that Ecumenical Accompaniers have in all the placements is to monitor Check Points. There are a couple of different types of check points, one being agricultural and the others are providing accesses to Israel via the Green Line and the Separation Wall. We don’t have agricultural check points in our area but they provide the farmer or shepherd access to their land. In writing this article I can only represent what occurs at the check points in our area. In 1948 when Israel declared itself a country an unofficial border was established called the green line. Israel built the Separation Wall commencing in 2003. It was to follow the green line as a deterrent to attacks from Palestians. Although far from being completed, major portions of the Separation Wall that has been completed now have deviated into Palestians territory encompassing valuable land and water resources in the process. Due to the Separation Wall not being completed there are many large gaps and therefore in reality hasn’t become the security blanket for it was originally intended. But that is an issue for another day. The Seam is the area between the Separation Wall and the Green Line where in fact many Palestians still forge a difficult life requiring hard to get if not impossible to obtain permits to leave the area where they live and cross either the Green Line or the Separation Wall for such essentials as employment, medical care, basic shopping needs, visiting family or attending religious activities. In our area we in fact have families living in the Seam where we frequently monitor the check point to ensure that their young children can attend and return home from school without undue harassment from the border guards. When we are in attendance the back packs etc. of these children as young as 6 years old are searched. Then without too much delay they are permitted to proceed through the check point. When we aren’t in attendance they are frequently delayed anywhere from a half hour to over four hours if for no apparent reason other than to humiliate and harass them. These children go through this routine every single day they attend school. Every Sunday morning between 4AM and 7AM we monitor our main check point that provides access between the Separation Wall and Palestine, in our case Southern Hebron Hills. As I attempt to describe the situation that greets us each Sunday morning at this check point I would be remiss if I didn’t acknowledge the difficulty that I have had in coming up with the words to actually describe not only the visual impact of what we see, but the emotional and physiological impact these few hours have not only us as volunteers but on everyone that is witness to the human tragedy that unfolds before us. My colleagues and I have discussed the check point duty several times and are in total agreement on how heart wrenching, how traumatic these few hours are. Photographing of the check point is not allowed and as a result there is minimal visuals of the scene. We drive the three quarters of an hour from our residence to the Check Point taking a mixture of rough gravel roads and modern highways being passed by an assortment of vans and vehicles all racing to the same destination. Upon arrival at the entrance to the Check Point we are waved over by heavily armed police to park beside their armored personnel carrier. We go through the routine of having our identification checked even though they seem to be fully aware of who all of us are and then waved through. As we are going through this process a number of Palestians run just feet from these police up and over a hill, apparently headed to a hole in the Separation Wall where they will enter illegally the Israeli side of the border. The police seem oblivious to this activity. The roadway leading to the actual Check Point is lined on one side with a variety of kiosks where venders are peddling anything from fresh coffee (very strong), orange juice, freshly cooked food and other wares. These stalls are all powered by plugging into their vehicle parked in the gravel parking lot behind. Meantime the vehicle and pedestrian traffic past these stalls is relentless generating the hubbub you might see in a large city market area. 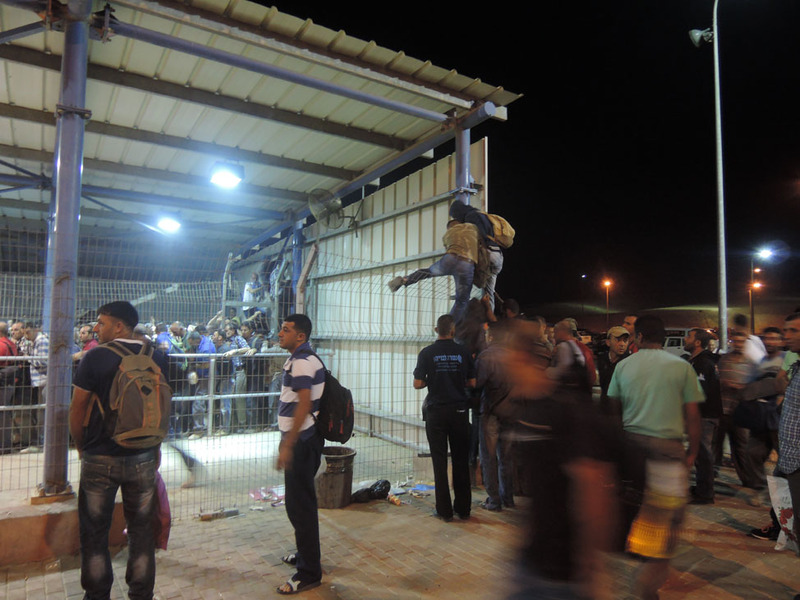 The Check Point sits straddling the Separation Wall with numerous fences, gates all secured but ready for a quick opening if need be by security forces. A watch tower is situated on the left side of the main structure where vehicles are cleared and the another watch tower is located in the middle providing surveillance to those entering through the entrance shed which leads to a heavily barred chute, turnstile and on into the security area where to two lines led to actual screening stations. Cameras cover every inch of the facility. People enter the approximate 40’ x 40’ three sided metal shed and immediately enter into a metal piped snake similar to at most airport departure gates. The open side of the shed faces the inside towards the tower and is closed off with heavy gauge wire. The snake path eventually leads to the piped chute and turnstile. This is where we stand for three hours. The Check Point is scheduled to open at 4AM. Our role, as the two EAs present, is to track the number of people going through every half hour including the number of women and children. This is done to assist a number of agencies including the United Nations. 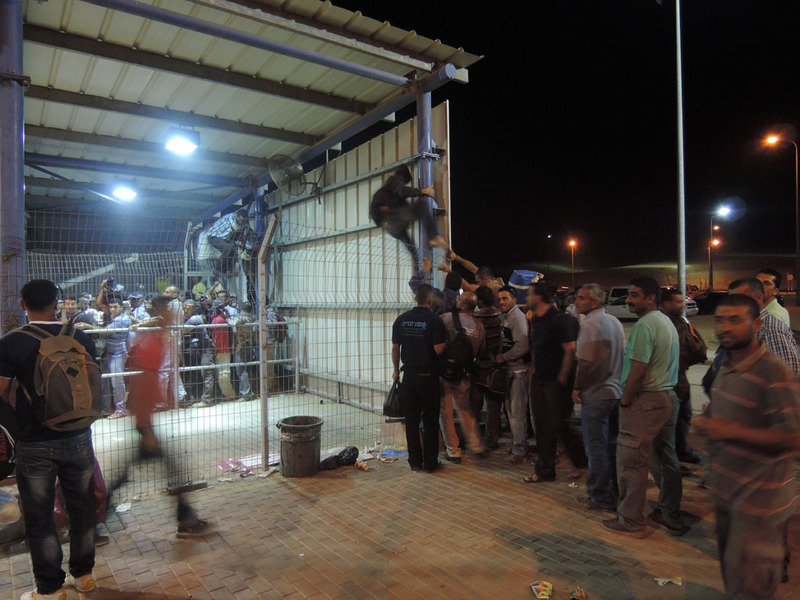 We also intercept the many individuals returning through a special gate, to ascertain why they have been rejected. 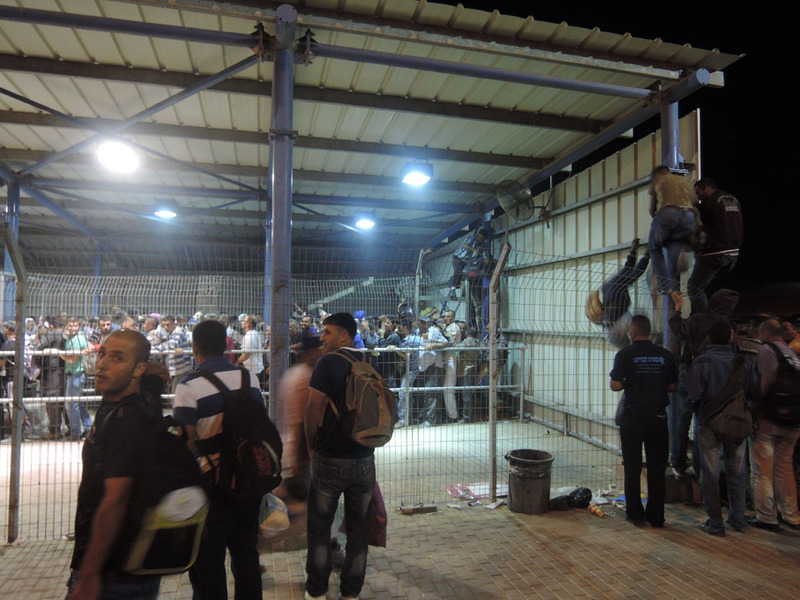 The majority of people going through this Check Point are going to jobs on the Israeli side of the border. Some are going for other reasons including medical, visiting family in prisons or assorted other personal reasons. When we arrive at 3:45 AM there are in the vicinity of 600 people already crammed into the shed with the line extending out into the entrance road. The mood at this time is resolve, if not relaxed. Shortly after 4:05 the turnstile is opened and the people steadily make their way through. It doesn’t take long for the atmosphere to change as it will several times through the three hours we are at our post. The noise level accelerates and almost immediately the lengthy line compresses, trampling and tightly squashing everyone the length of the line, young, old, healthy and those not so healthy. At the same time individuals start climbing the walls and re-enforcement piping that rises across the width of the room. They start making their way to the front of the procession, often climbing on the heads and shoulders of those unfortunate to be beneath their path. Upon reaching the front, they calmly make their way to the front of the line. Those already at the front always let them in without protest. One of the first individuals to climb his way to the front and jump down on the last Sunday when we were present broke his ankle upon landing. He had to remain just across the fenced wall from where we were standing without medical attention almost until the end when he could make his way back through the incoming crowd. Those rejected are rejected because of expired passes, carrying an unacceptable parcel, being on one of the many blacklists, many other reasons and just because. On the other side of the Check Point, those that have successfully made it through walk a lengthy pathway between the structure and the Separation Wall. A steady stream of individuals make their way to the fence to relieve themselves. When they reach the far end of the structure operators of numerous taxis, buses and private cars seek to attract the attention of the dreary faced individuals. A concession on the exit side also pushes the thick black coffee. Throughout the hours that this process takes place men get down and pray where ever there is a clear spot out of the way. It is very difficult to imagine unless you have witnessed this event. It is difficult to imagine livestock being treated in this manner. In fact as I was standing counting off the people as they passed one individual commented to me that it must be like counting cattle. This process is very humiliating to all involved, it is dehumanizing and could very much be organized in a fashion to ensure the security the authorities are seeking while treating individuals with respect. Those going through, including those that have been rejected accept this as part of life in Palestine. This is truly a very unpleasant part of our job. I cannot accept this as normal. I am pleased to report that the shooting of the 12 year old boy is the subject of an ongoing investigation by the Israeli Army who have apologized for the incident. Various authorities that we have discussed the case with have stated that this is truly a very unique incident, totally unprovoked, early in the morning, very quiet, one bullet, one death. I am currently tracking down Doctors with Borders, who you can imagine are very busy in Gaza. A number of agencies are involved and we will be visiting the family again this coming week to provide an update and to check on them. 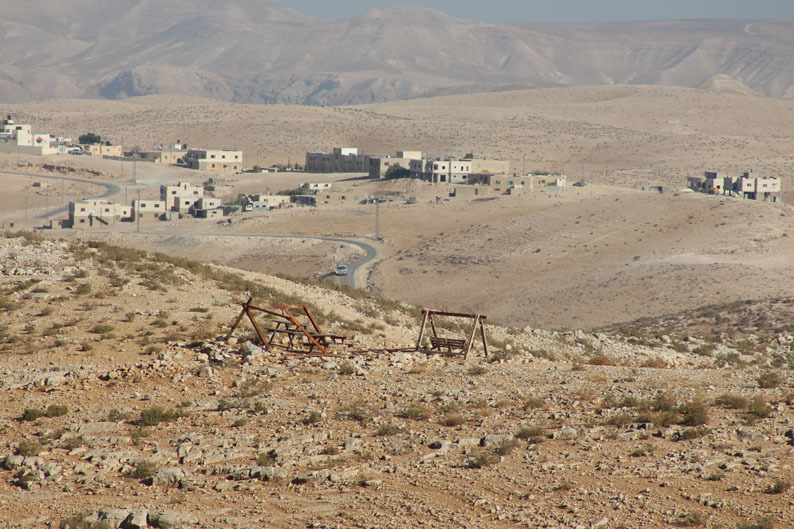 I am not pleased to report that the Israeli courts have ruled that because the ownership of the land by the current residents is 35 years old, the hill shown with the tent frames on the article about Um al Kher (Resolved), the ownership is not valid. Therefore possibly as early as this fall the neighboring Israeli Settlement of Karmel will be expanding the length of this hill side. 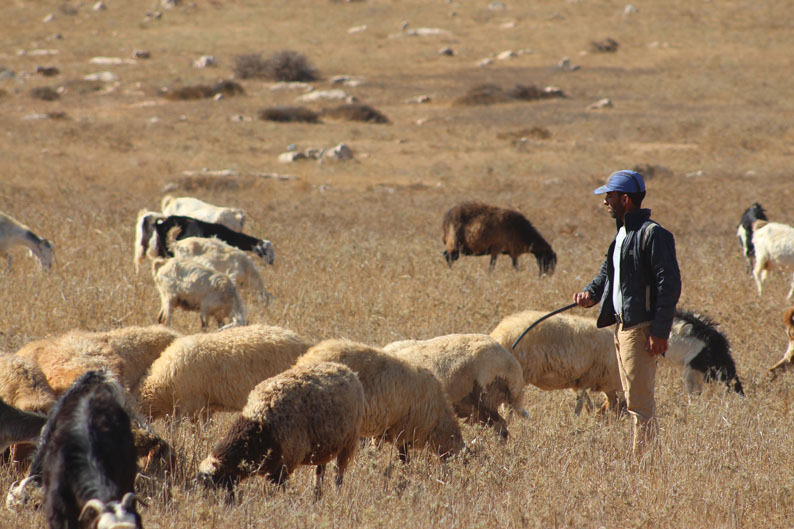 This means that the grazing lands for the shepherds of Um al Kher not only will be significantly reduced but that access to a major portion of the grazing land will be all but eliminated. Dual Vision perhaps best describes the surroundings as they came to me during three afternoons this past week of providing a protective presence to one shepherd in particular. I say one in particular because the village of Wadie T’ Hesh is in reality home to a small number of shepherds who mind their flocks generally in the same area simultaneously , but only occasionally within sight of each other. This protective presence is offered to discourage ongoing harassments and assaults by residents of the neighboring settlements and outposts. 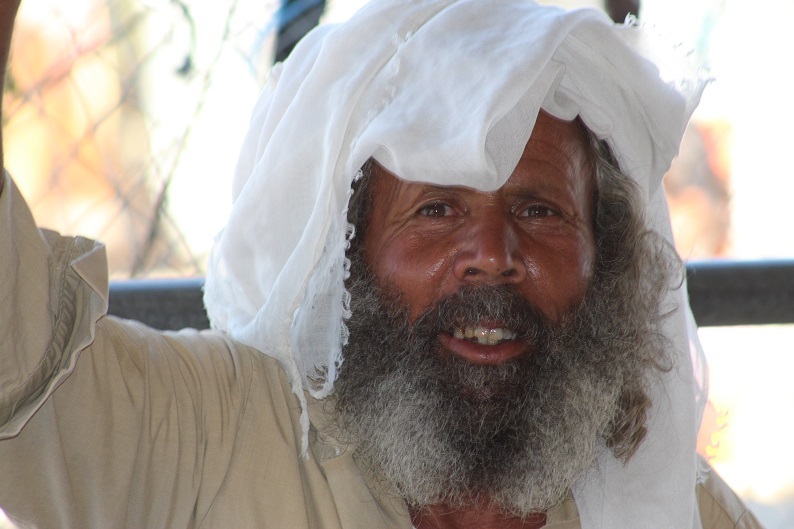 As each afternoon unfolds Kamel, the shepherd we are assisting, appears on foot with his flock of approximately 100 sheep and goats, accompanied by his donkey and two dogs around the top of a hill to our west before descending into a valley generally in our direction. 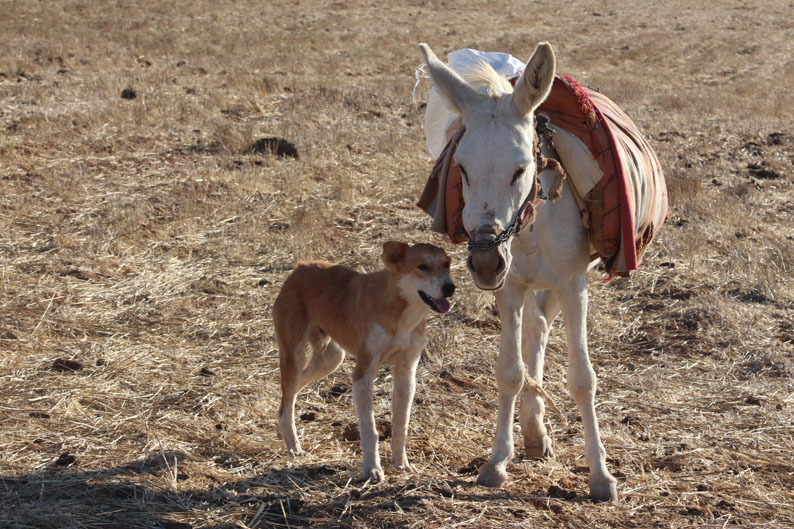 After some minutes they appear again, now with Kamel now astride the blanketed donkey. 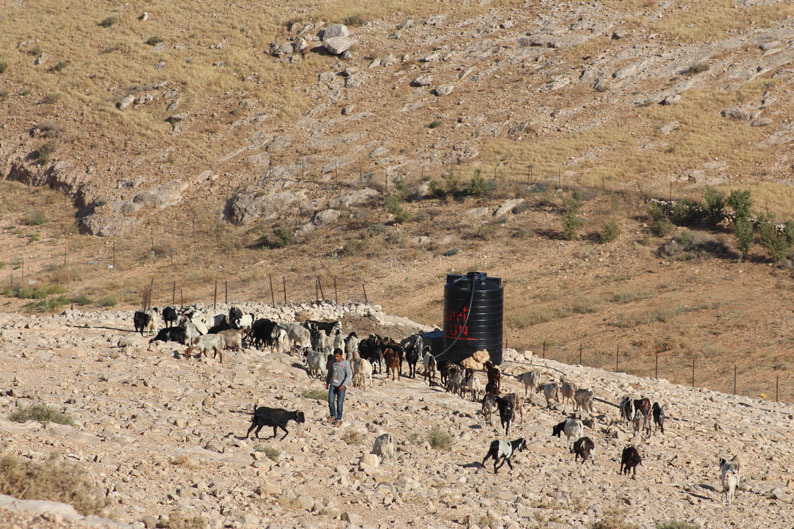 He steers the flock eastwardly to where they reach a plateau separated from settlement land by a road leading to the ever present Army Security Tower. For the next two or three hours the flock is moved around a wide plateau of dry barley, thistles and rocks. 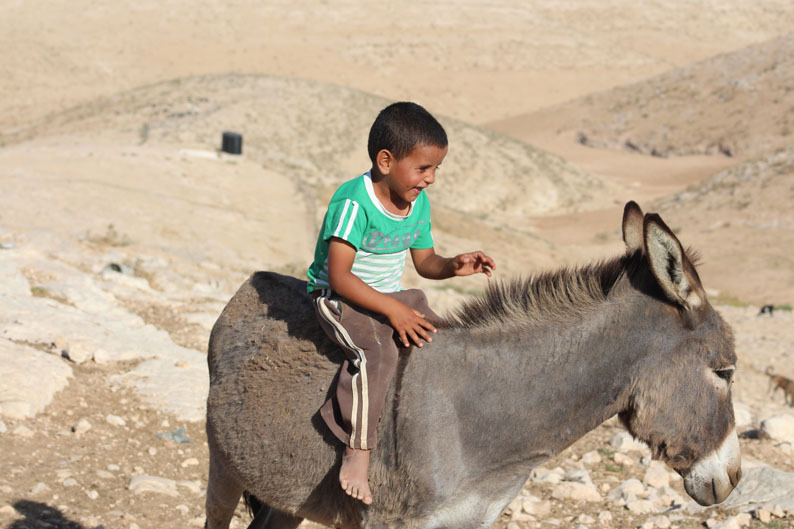 For the most part Kamel, who has now dismounted from the donkey, wanders on the perimeter of the flock frequently emitting various sounds and whistles that obviously mean something to the wandering flock but not to me. It is amazing how they respond, for without these sounds they no doubt be off and gone who knows where and who knows into what trouble. Standing in the ancient hills of Palestine viewing the scene as I have described would almost make you believe that you had gone back in time. More than a few things however can bring you back to the present time, not the least Kamel riding his donkey talking on his cell phone. Or perhaps it was the approximate twenty Israeli fighter jets preforming maneuvers directly overhead including practice dogfights complete with firing of tracer missiles. Looking over top of the flock of sheep in almost every direction one can see the settlements, the outposts and a major check point between Israel and Palestine. Traffic of all sorts can be seen but not heard on the many roadways that lead in multiple directions in the valleys and hills far away. It is indeed a very strange mix of old and new. But in the warm heat of the afternoon it is the old, the serenity of the shepherd and his flock that wins out. Our afternoons were rewarded with no incidents that disturb the tranquility except for days end when we were invited to join a number of shepherds and their families on top a hill, drink tea and watch the sun go down. Pretty hard to take. Returning from Jerusalem on the 12th of August our team’s first priority was to follow up on the fatal shooting by an Israeli soldier of a 12 year old boy Khalil Muhammad Ahmad al-Amiti in the front of his house in Fawwar Refugee Camp in the South Hebron Hills of the West Bank on the 10th of this month. We were told that although some other boys had been throwing rocks at the soldiers, this boy had just came to the front of his house to see what all the noise was about. To our knowledge their has been no release of any information further to an investigation into this incident by the army. To be clear our role is not necessarily to investigate, but to assist the family and community that we can. Khoulod Al-Titi, our community contact and local English teacher took us to her house in the refugee camp where she introduced us to her husband, also a teacher and youth club manager. We sat with them and their seven children and like in almost every house have entered since arriving, we are served tea. Our hosts are very upbeat and optimistic about the future while expressing frustration about not being able to return to their ancestor’s home. 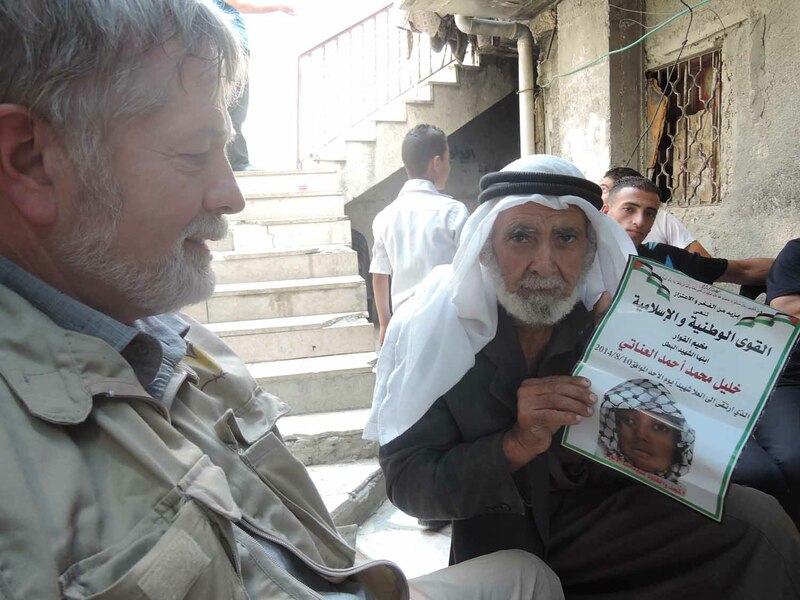 Khoulod’s ancestors had been exiled from their homes and moved to Fawwar Refugee Camp in the “catastrophe” in 1949 by Israeli forces as had several hundred Palestinians. Despite the first United Nations Resolution in 1952 ordering Israel to allow refugees to return to their homes this has not happened. On the way to meet with the family of the slain youth we walked by the memorial that has been created in memory of Amiti. A small group of interested by-standers quickly joined us including a 19 year old youth in a wheel chair who claimed that he had been shot by an Israeli soldier 4 years previous. We wound our way through the alleys of the refugee camp until we reached a section in the alley where chairs had been assembled. Quickly we were joined by Amiti’s parents, uncle, brothers and sisters, grandfather as well as numerous other grief stricken friends and neighbors. As the anger and frustration poured out from all sides it was evident that they were indeed suffering from this recent tragedy but also very tired of the circumstances that they have been forced to live in through no fault of their own for decades. They clearly were looking for support, help and a way out of this situation that they and their children are forced to live in. In the middle of their out pouring and answering the questions we had posed to them, people came from every direction placing in front of us tea and considerable fresh baking and sweets. We made to feel very welcome in their community and their home. We will be returning to visit with them before the end of the month, hopefully with some assistance to help them in some small way for the needless death of this boy. What is needed however is for “Just Peace” – for an end to the occupation and end for hostilities by all parties involved.